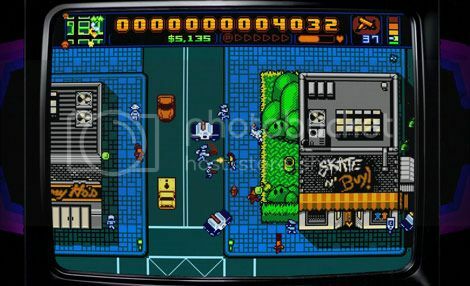 Summed up, Retro City Rampage is a parody-fuelled, fourth wall breaking fiesta of guns, car chases, crazy power-ups and endless tributes to 80s / 90s pop-culture. I’ll admit, I’ve been waiting at least 5 months to get my hands on this game. I do have a soft spot for rekindling my childhood through retro 8-bit type games, so I was excited to see what Retro City Rampage could muster. First thing to consider when you play Retro City Rampage is that one man, Brian Provinciano, made this entire game. Considering that the game is pretty massive, I have to give real kudos to how a one-man developed product could have been made with such finesse, grandiose and fantastic attention to detail. The story is pretty zany at best. You “the Player” are trying to find work in Theftropolis, a bustling 8-bit city full of crime and plenty of people to run over. Somewhere along your journey to becoming a master criminal, you meet Doc Choc (A parody of Doc Brown from The Back to the Future series) who has lost his time travelling car and needs you to collect parts for it. Apart from the main story, the player can complete a host of side quests ranging from time trial based killing sprees, challenge them to complete certain conditions such as blow up as many civilians with rocket launchers in under a minute or (my favourite) running around on fire and spreading the it to other civilians by running into them. Gameplay is easily compared to the original Grand Theft Auto games before they became 3D. However, instead of a strict top-down view, Retro City Rampage settles for a more visually aesthetic semi-top down isometric view that displays even more detail in the game’s environment. The player can traverse the map on foot, by car, bike, subway and even collect various power-ups such as sneakers that bestow crazy running speeds that will knock pedestrians left, right and centre. Weapons consist of guns such as pistols, shotguns, sub-machine guns, flamethrowers, rocket launchers, grenades, golf clubs, paddles, baseball bats, Bionic Commando’s arm and even your own fists. Although all the weapons are very effective, I found the most useful weapon of all to be your car, as it's quite difficult for its health to be depleted as you run over countless civilians and law enforcement collecting money and dropped weapons along the way. Controlling the player is a very smooth experience with the only controls to being the analogue stick for moving, and the jump button. Jumping is extremely effective to dodge gunfire and incoming cars, however you can use jumping to your advantage to stomp enemies Super Mario Bros. style. Driving is the most satisfying experience as turning your car is as easy as turning the player around when he’s on foot. I have to say that ramming into a massive crowd of civilians hasn’t been this satisfying since Carmageddon. There is a currency and points system as you play. Money is used for the purchase of power-ups, weapons and even customizations to your vehicle or your player’s appearance. As you play various missions or complete different tasks, you can unlock new appearances. As for score points, the PS Vita and PS3 version of Retro City Rampage uses the PlayStation Network to login and upload your scores earnt for various tasks and challenges to an online leaderboard – this effectively gives you a lot of replay value past the main story line’s completion. Often you will see in the top of the screen the amount of chain bonuses you are getting from killing people. It's pretty much an art form to keep the chain gauge going as the cool down for it is incredibly slim. In saying that, it's very satisfying to see the game updating you on your new highest chain score from time to time. Most of these score-based challenges or side-quests are usually quite easy to complete, however some of them don’t give you enough time and I felt were a bit unfair in their design, specifically the “Death” scenario were you play as Death and need to kill people in different neighbourhood. It’s challenging, but I felt the game design slowed me down a bit. The only semi-gripe I had control-wise was the implementation of a cover system that sometimes doesn’t work in tandem with the game’s auto-target control system. When you hold the fire button with any gun, you will auto-target the nearest enemy in the direction you are pushing the analogue stick – The disadvantage of this is that it can become a bit fidgety when selecting targets and becomes more of a free-for-all shooting spree where you just strafe and spray bullets in the hop of wiping all enemies in your path. Other major issues I found were also that the cops of Theftropolis are extremely responsive. It’s very easy to get the police after you and it’s quite difficult to get rid of them later. The other issue is that it's a little difficult to come by health and often you will want to find a snack vending machine to replenish it if the cops rain down on you hard. However, I will say for the most part that when you’re in a speedy car, you’re pretty much invincible, and ramming other cars off the road or driving into gunfire causes hardly any damage to your vehicle. The last negative point I will make is two-handed and is somewhat of a “marmite” issue. Firstly, I found that the screen doesn’t give you enough field of view to see oncoming traffic and in most cases when the cops are after you, they will try to run you over in their police cars travelling at very fast speeds. Most of the time they will hit you and take almost half or more of your health away; it’s pretty unfair unless you're lucky to jump out of their way, but they can be pretty heat-seeking about how they go after you and will somehow always manage to get a hit in. The last point is that the game is drenched in videogame and 80s/90s pop culture. This, for me, and many born in that timeframe, is a good thing mainly for the reason that people born in that period will “get” this game’s many parodies and references. For anyone else however, the game’s humor is probably pretty confusing and won’t make much sense to them. Regardless, I still feel this is one of the game's strengths as well as a potential weakness. I couldn’t help but feel sheer joy as I saw many of my favourite childhood videogames, TV shows, Films all parodied in some form or the other through Retro City Rampage. Any famous videogame stereotype or classic of the last 30 years is in this game; you name it, even down to infamous typos that were present in old NES games such as Ghostbusters or Metal Gear. In this sense, you can really tell that this game is made for gamers: it's a love note to anyone dedicated enough to play games over the past 20~30 years and celebrates and collects all videogame culture in one package. The same celebration of retro goodness continues graphically, allowing the player to change how they view the game with many familiar video game colour scheme types ranging from the, NES, DOS, Commodore and even the ability to add TV scan lines to your experience. Brian Provinciano’s dedication to give us a extremely detailed 8-bit experience is un-paralleled and I loved how even the smallest detail like the subway’s station announcement screen had digitized 8-bit text flashing across it. 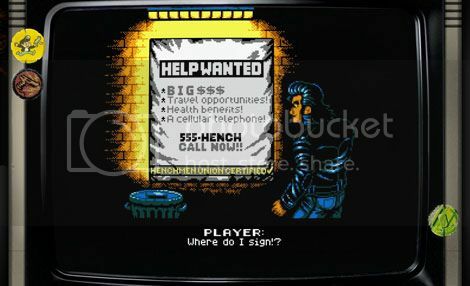 It's small details like this that really brought the world of Retro City Rampage to life. 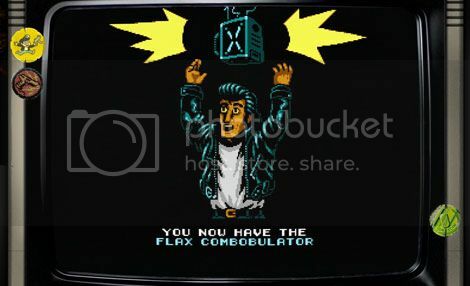 Another fantastic implementation was the mini-games you find scattered throughout on various Arcade machines. Two of my favorite games paid homage to recent famous indie retro-styled games in the form of Super Meat Boy and Bit.Trip – my jaw dropped when I saw a Super Meat Boy styled game rendered with Outrun type graphics, with a Virtual Boy colour scheme that could be played in 3D – If that’s not dedication to your craft, I don’t know what it is. Other features include an Arcade and Free-roam mode. Free-roam mode is pretty self explanatory, allowing the player to explore the game map at will doing what they want. The Arcade mode collects all the challenge quests you find throughout the city into one. The last fantastic strength of this game is its music and sound. Without a doubt, sound-wise this game is everything that an old 80s made 8-bit game should sound like, even down to its music. The soundtrack is wonderfully crafted with some of the most authentic sounding chip tunes I’ve heard. I often found myself taking my time to complete a mission because I was enjoying listening to the unique background theme. Thankfully, you can listen to most of the music in the game when you drive around the city flicking through the GTA-style fictional radio stations. I really loved the indoor environments as well; I felt it drew some aesthetical similarities to the fantastic Hotline: Miami – I loved the colourful pallet of colours used and, yet again, I must mention the level of detail used really brings to life even very small environments like tiny rooms in buildings etc. This game is a triumph in every way for what it is, and for a fairly large game priced at £8.99, you would be pretty hard pressed to be overly negative about the game in any sort of way. Of course it does borrow a lot from retro videogame pop-culture, but that is the point, so I could never see this as a disadvantage, especially as no other game celebrates it in such a masterful way. I give my full respect to Brian Provinciano for creating this wonderful game, but I do say that I think he deserves a bigger team next time so he can roll out his product a bit faster in the future. I must stress, however, that Brian delayed release to ensure that it was absolutely perfect and bug-free, and when you compare that to the number of games nowadays that are rushed to sale and skimp on QA testing, I can’t help but give him even more kudos. Retro City RampagePS Vita and PS3 versions (you obtain both versions when you buy the game for only £8.99) is really worth the money. Sure the Vita might not show all those retro TV scan lines as well as the PS3 version, but it becomes a whole different beast as a portable game, one that's enjoyable and so arcade-like that it fits the Vita' nature and aesthetical appeal perfectly. The wait was more than worth it. Now, I have to go back and rob some banks in my dune buggy kitted out with duel gatling guns.